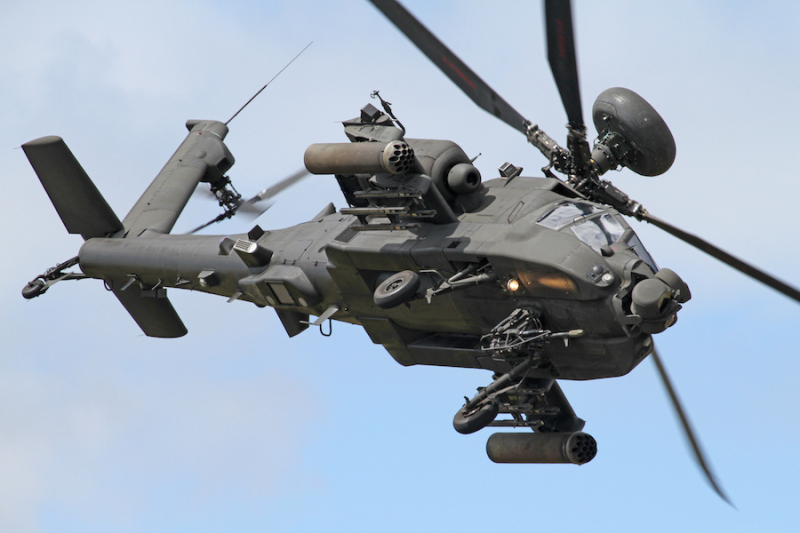 The post-Brexit drop in sterling’s exchange value has increased by 15% the cost of awarding the $3 billion Apache Guardian contract to Boeing, while making Leonardo Helicopters’ sterling-denominated bid that much more competitive. PARIS --- Two major British defense contracts due to be awarded this summer to Boeing Co. may be deferred pending the appointment of a new Prime Minister, as their cost has increased by a combined £600 million because of the pound sterling’s post-Brexit drop on in value compared to the US dollar. The fact that both contracts -- one for nine Boeing P-8A maritime surveillance aircraft, and the other for 50 AH-64E Apache Guardian attack helicopters – were being kept on the back burner so they could be announced during next week’s Farnborough Air Show means that, post-Brexit, the UK can now postpone them, if it so decides, with no legal consequences. Both contracts are also controversial in different ways; neither has been openly competed, and neither will generate offsets since they will be awarded through the Foreign Military Sales program, which allows none, so there will also be a political price to pay. There financial price is already here. The post-Brexit drop in the pound’s exchange value means imported goods paid in US dollars are today 15% more expensive than they were on June 23. In sterling terms, this has added over £600 million to the combined cost of both contracts (from £4.1 billion to £4.7 billion), and this is likely to increase further if, as widely predicted, the pound continues to fall. The first contract, for nine Boeing P-8A Poseidon maritime patrol aircraft and related services, is worth about $3.2 billion, according to a March 25, 2016 notification to Congress by the US Defense Security Cooperation Agency (DSCA). This contract is “the United Kingdom’s highest priority unfunded requirement,” the DSCA noted at the time, because the abrupt cancellation of the Nimrod MRA4 Maritime Patrol Aircraft program in 2010 left the UK without the capacity to patrol its own waters. Embarrassingly, the British government was several times forced to request help from its NATO allies in 2015 to hunt unidentified submarines cruising in its waters. Even before the Brexit vote and Prime Minister David Cameron’s June 24 resignation, the British government appeared ambivalent about this purchase, as was clearly demonstrated in recent written answers to Parliamentary questions by Philip Dunne, the government’s defense procurement minister. On June 28, he confirmed that “we intend to begin ordering P-8 Poseidon aircraft this summer,” confirming statements made by his boss, Secretary of State for Defence Michael Fallon, during a recent visit to the United States. He also confirmed that the aircraft “will be purchased through a Foreign Military Sales (FMS) agreement with the US Government, which allows us to get the capability we need within the required timeline,” i.e. urgently. In a separate June 28 answer, however, Dunne said that “The main investment decision on the UK's Maritime Patrol Aircraft programme has not yet been taken by Ministers,” which suggests that it may now no longer be taken during the original time-frame. Dunne also said that “the date at which the aircraft will be brought into service has yet to be determined,” simply saying that “at least three of the aircraft will be in place by the end of the current Parliament,” or 2020. Interestingly, the Royal Air Force will not be able to refuel its P-8As in flight, as they are fitted for “boom and receptacle” refueling while RAF’s Voyager air tankers uses a different “probe and basket” configuration which is not compatible. So, while they will belatedly restore the UK’s maritime patrol capability, and fix one of the most glaring mistakes made by Prime Minister David Cameron’s coalition government, British Poseidons will still be limited by their unrefueled range – a serious weakness when trying to patrol both the British coastline and North Atlantic with nine aircraft based at RAF Lossiemouth, in Scotland. The second contract, worth about $3 billion according to the August 2015 Congressional notification by the DSCA, covers the remanufacture of 50 of the British Army’s current fleet of AH-64D Apache Longbow attack helicopters to the latest AH-64E Apache Guardian standard. The Ministry of Defence had decided it could save money by awarding this contract to Boeing, which by adding it to a similar Army contract could offer a lower price than the UK’s national contractor, Yeovil-based AgustaWestland (now Leonardo Helicopters), which built the original Apaches. Giving the work to Boeing, however, would cost UK jobs at Leonardo-Yeovil, as British media have estimated 600 jobs depend on this contract out of the 3,700 people employed there. The Ministry of Defence might now prefer to postpone the decision until a new government is appointed in September, which would also avoid taking work away from Yeovil at the very time Leonardo is deciding the future of its UK business. The economic case for awarding the work to Boeing has now been upset by the drop in the pound’s exchange value, which has so far added nearly £300 million to Boeing’s price, making Leonardo’s offer that much more attractive. The foreign exchange risk is especially significant if the Apache support contract, which will run for 25 years, goes to Boeing, but it immediately disappears if the contract goes to Leonardo, a British company paid in sterling. A possible compromise would be to award the production work to Boeing while giving Leonardo the support contract, which over its lifetime will account for over two-thirds of the $3.2 billion total, but this requires a political will that may not be available in the present circumstances. He also noted that “Boeing has doubled its UK workforce and spending with the UK supply chain in the last five years to more than 2,000 employees and almost £2 billion a year respectively, supporting 12,700 jobs in the tier one supply chain in the UK. This growth continues in 2016 and beyond."